VALENTINE'S PARENTS NIGHT OUT: February 15th & 16th. Dana’s Clinics Feb 15th & 17th. It's cheer tryout season! Schedule weekly PRIVATE LESSONS with our amazing HEC staff now! We always have some EXCITING news you can use!!! 02/04/2019 - It's Season 6 at HEC!!! Don't see a class that fits your schedule? No problem! Want to create a PRIVATE CLASS time exclusive to you and your buddies? We offer just that! Send us an email, or come by the gym to see if we have the availability to open up a class that best suits your needs. Our goal is to accommodate as many people with a shared interest as possible. We want to make your life easier! Please email us at houstonelitecheer@yahoo.com so we can put you on the waiting list. All you need is four athletes to start your very own class, ANY time, ANY day! Email us IMMEDIATELY! WE LOVE TO ACCOMMODATE OUR CLIENTS' SCHEDULES! We offer TUMBLING CLASSES for beginners with no experience to advanced athletes. Want to see what classes we have to offer? Take a look at our "2019 Class Schedule" on the "Forms" page on our website. 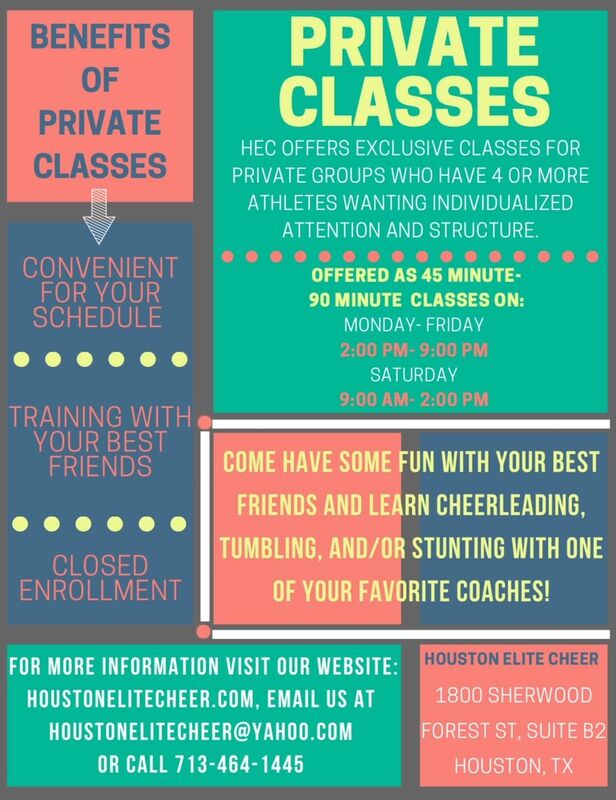 If you do not see a class on our class schedule that accommodates you, just inform us via email at houstonelitecheer@yahoo.com, and we will consider opening a class that accommodates your schedule as long as it satisfies the minumum number of students to start a class. Whether you are a seasoned, advanced athlete or a newbie, Houston Elite Cheer is THE place to be! WE HAVE THE BEST RATIOS IN HOUSTON! Ask about us!!! 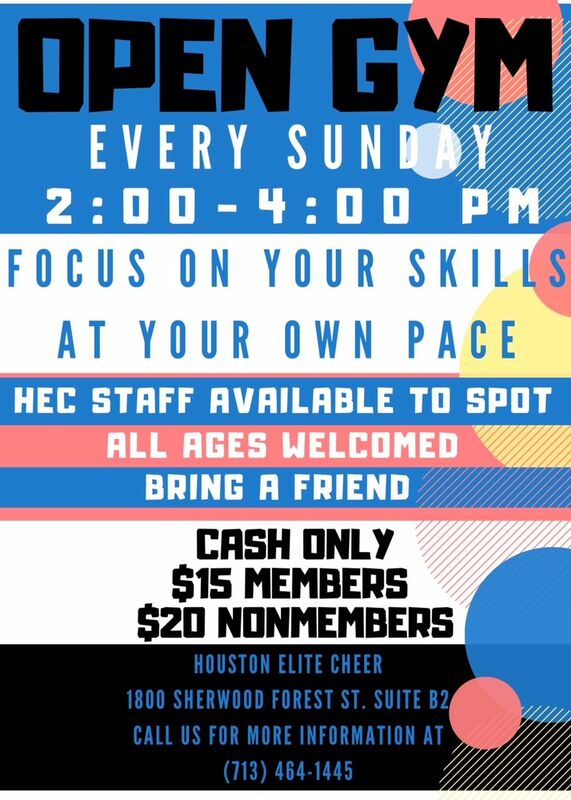 If you have any questions, please call (713) 464-1445, or email us at houstonelitecheer@yahoo.com. 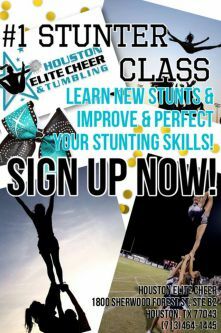 Sign up for "TUMBLING CLASSES" today! 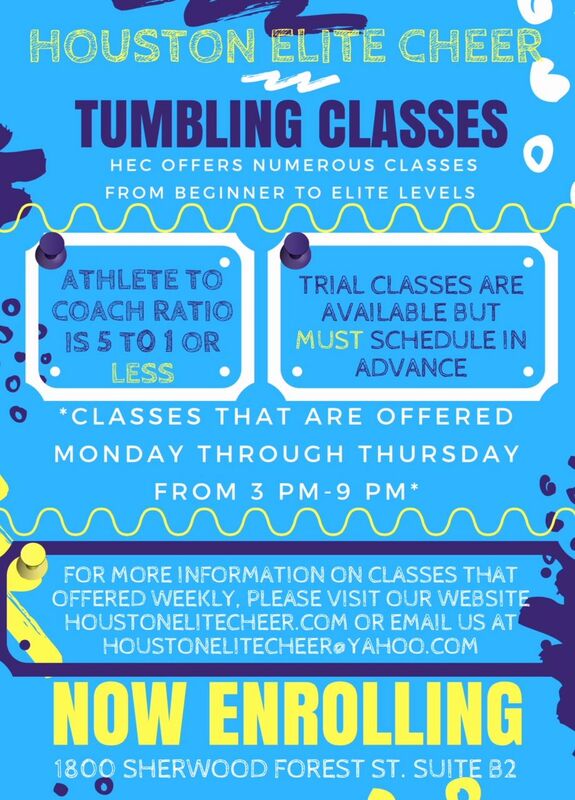 Email Lauryn at the front desk at houstonelitecheer@yahoo.com for more information and enrollment in our TUMBLING CLASSES. We have small coach to athlete ratios! If your squad wants to be "game day ready" and dominate the sideline, SCHOOL SQUAD TRAINING is a service that we offer Monday through Sunday at a prearranged time frame at HEC or at your school. Choreography is offered separately, and the cost is based upon the needs of the squad. HEC offers SCHOOL SQUAD TRAINING camps and clinics at HEC or at your facility. SCHOOL SQUAD TRAINING may include summer cheer camp preparation, tumbling classes, stunt clinics, pep rally/game day routines, competition routines, strength and conditioning workouts, flexibility training and other skills as requested. Arrangements can be made for a one-time training session, short-term or long-term training. Bring it on! Let Houston Elite Cheer teach you how to own that sideline! For more information, call or text Dana directly or the gym at (713) 464-1445, email us at houstonelitecheer@yahoo.com or stop by the gym. This class will highlight all the areas of cheerleading including: Jumps, motion technique, spiriting, dance, stunting, strength and conditioning, facial expression, minimal unassisted tumbling and charisma. Athletes will learn chants, cheers and dances. This class is designed to give our athletes an overall feel of the sport, so they know exactly what to expect should they decide to pursue this sport in the future. The "BRING IT" class is similar but different from our Game Day class. In our "BRING IT" class, we want to get a head start on perfecting the skills necessary to one day outshine their competition, dominate the sideline, shine on the stage, rule the floor and/or make your school's squad. If you think you have what it takes, BRING IT!!! 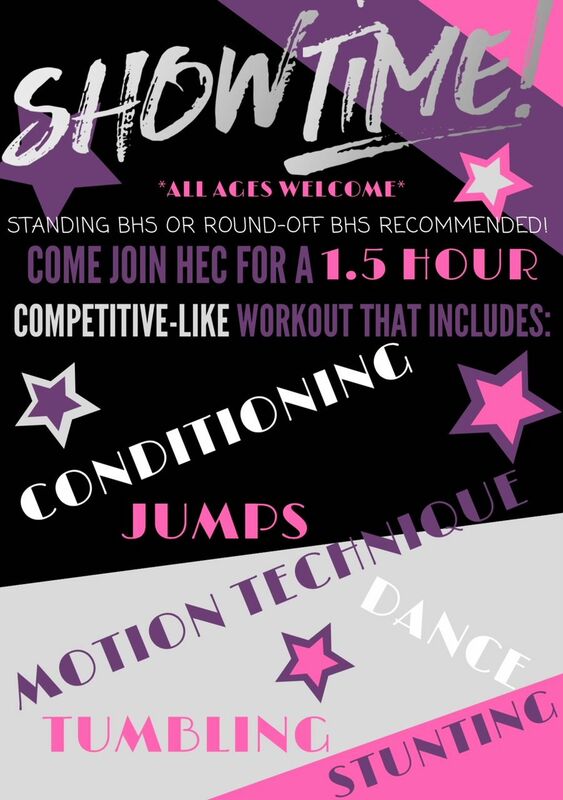 HEC will give you a complete overview of the sport and show you how real cheerleading is done! Start now! The bar is being raised throughout Houston, surrounding schools and colleges. Competition is getting harder and harder, so don't wait until the last minute! Sign up today because space is limited! The "BRING IT" class, unlike our other classes, will fill up faster because we are only offering ONE class time, and once we meet our targeted ratio, we will close enrollment. Interested in trying out for school cheer? Just take a look at this line-up of activities included in the GAME DAY class: Jumps, motion technique, chants, spiriting, flexibility, conditioning, minimal stunting and minimal unassisted tumbling. Wow! Athletes who are serious about making their school's squad will no doubt want to sign up for this tryout preparation class. Current cheerleaders who have to tryout in the spring are highly encouraged to attend this tryout preparation class. As cheerleading tryouts approach, athletes will learn how to maximize the scoresheet and "wow" the judges. Tips and the "do's and don'ts" of the tryout process will be discussed in detail along with each school's specific requirements. Athletes will be given instruction on how to do their entrance. 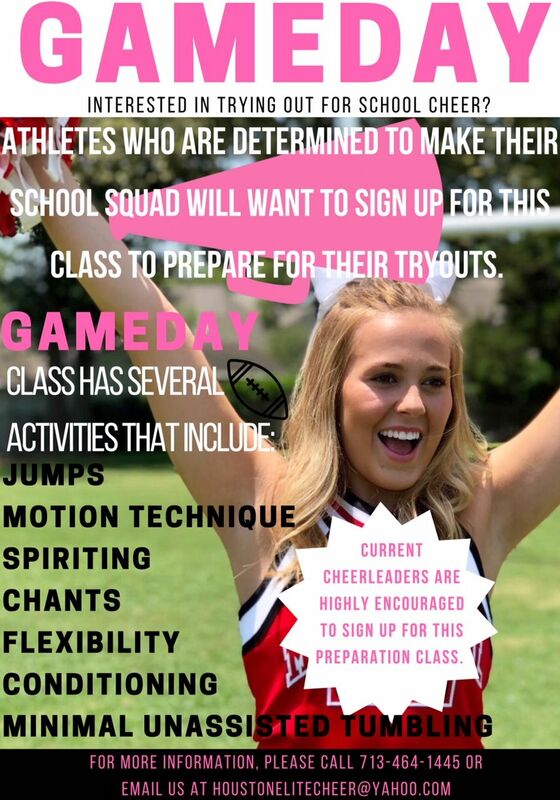 The GAME DAY class is highly recommended and offers information that is pertinent for a successful cheerleading tryout. Do not wait until cheer season to sign up! To be fully prepared for tryouts, you have to work hard and be consistent with your training and dedicate a substantial amount of time in preparation for cheer tryouts. The closer tryouts get the more prospective cheerleaders appear. SIGN UP NOW! 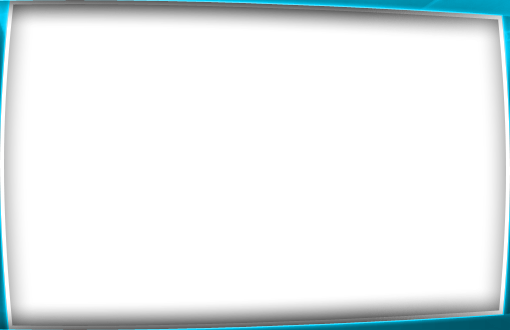 The GAME DAY class, unlike the others will fill up faster because we want smaller ratios so that we can give individualized attention to the athletes. Sign up today because space is limited, and we want you to be fully prepared by training in the GAME DAY class as long as possible before the big day. 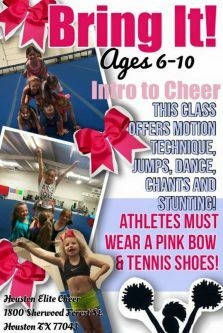 The GAME DAY class is instructed by qualified instructors and game day experts with tons of years cheerleading experience. They know exactly what judges look for. Enroll TODAY! The "#1 STUNTER" class is designed to teach beginner to elite level athletes how to STUNT, learn new STUNTS and improve and perfect STUNTING skills they already have. You do not have to be on a cheer squad or have any prior experience to enroll. Athletes may practice all-girl STUNTING, two-man STUNTING and also coed STUNTING. Bases, flyers and backspots will focus on technique, balance, flexibility, body control, strength and conditioning and most importantly SAFETY! If you are on a competitive squad or your school's cheer squad, bring your entire STUNTING group to polish your STUNTING skills or to tackle a STUNT section that is inconsistent. If you are trying out to be a collegiate cheerleader, this class is perfect for you! Come all-girl or coed STUNT with current and former collegiate cheerleaders, so you are confident and flying and basing with ease at tryouts. Get expert advice from current and former cheerleaders with many years of diverse experience at all levels. In order to guarantee a spot in this class, you must enroll. If you would like to try the class, you must schedule in advance via email. All #1 STUNTER enrolled athletes must have a registration fee paid, a registration form filled out AND an "Account Guarantee" on file. Space is limited for SAFETY reasons and to ensure this class is efficient, since athletes will be flying and basing with HEC coaches. If you are ready to slay the competition, steal the spotlight and shine on the sideline, email us TODAY! This is the class you have been searching for! If you want an intense cheer workout that includes all the aspects of cheerleading, this is it!!! Even with the extended hours, this class is action packed! Tumbling, Stunting, Jumps, Motion Technique, Dance and Strength and Conditioning. SHOWTIME prepares you to be an all-around fabulous cheerleader. So you think you are a hot shot because you have your back handspring? Well we think you are and if you do too, you are the perfect athlete for this team workout. Because this is an exclusive class, you must have prior approval from HEC staff to join SHOWTIME. Step up to the plate if you are ready to work hard! LIGHTS.. CAMERA.. ACTION! It's SHOWTIME baby!!! 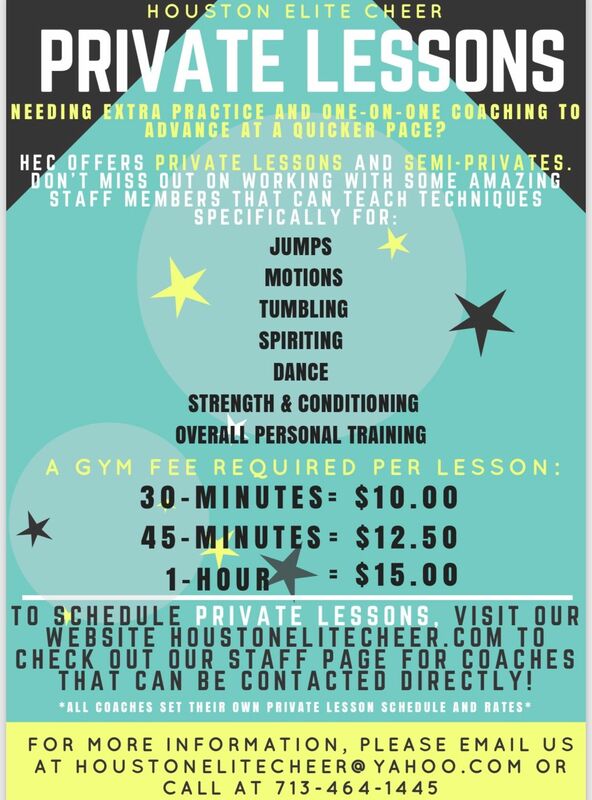 Set up an appointment by emailing houstonelitecheer@yahoo.com, or call the gym at (713) 464-1445. After you make your appointment, come by the gym so we can evaluate your skill level. Fun! Fun! Fun! OPEN GYM is a time for athletes to focus on skills at their own pace in a laid back atmosphere. There is no structure to open gym. Staff will be available to spot tumbling. Stunting is not allowed. Nonmembers must fill out HEC's "General Waiver Form" form in order to participate. The waiver can be found on the "Forms" section, and must be turned in before athletes enter the gym. Check our "Calendar" before attending OPEN GYM. Let Houston Elite Cheer be a part of your special day! We love hosting BIRTHDAY PARTIES! HEC hosts BIRTHDAY PARTIES on Fridays, Saturdays and Sundays. Each party is 60-120 minutes of jam-packed fun. HEC will provide structured games and minimal decoration including tablecloth, matching cups, napkins, plates and plastic utensils. Party favors, goodie bags and special accomodations are available for an additional cost. 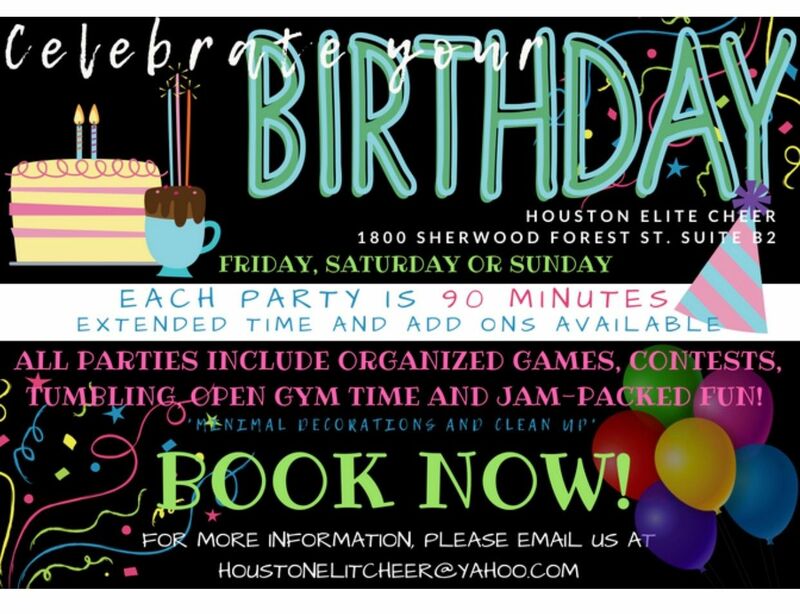 To reserve a birthday party at HEC, a $100 nonrefundable deposit must be made, and the "Houston Elite Cheer Birthday Party Agreement" must be completed. Please inform staff of preferred party colors when making the reservation. Come by the gym to make your reservation in cash or by check and obtain the waiver for all party participants. The "Forms" section has more information about birthday parties. So let us help make your BIRTHDAY PARTY go out with a bang! Call us at (713) 464-1445 or email houstonelitecheer@yahoo.com for further details. HEC SUMMER CAMPS are so much fun! CAMP kids play games, create arts & crafts projects, learn cheers/chants and work really hard on tumbling skills. HEC CAMPERS have a blast! Reserve your spot by making a deposit. Space is limited. To register, email your completed registration form and payment to houstonelitecheer@yahoo.com or come by the gym to register in person. 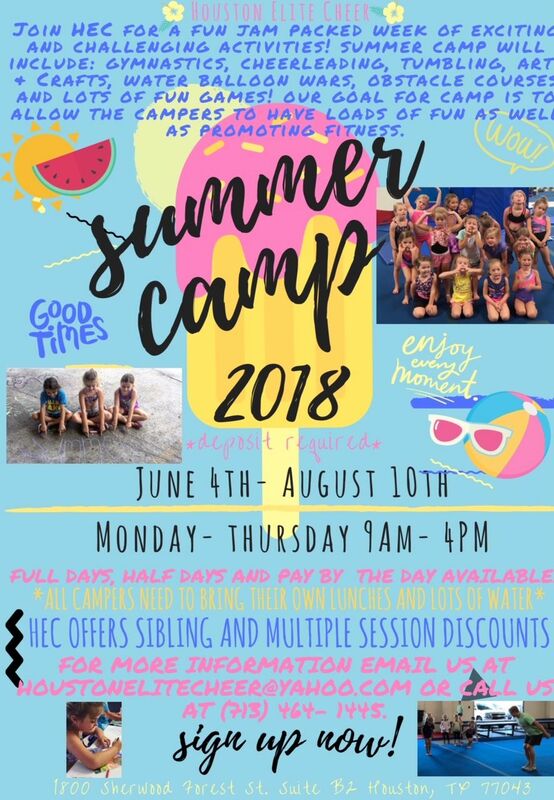 Detailed information is available on the "Summer Camp 2018" page in the "Forms" section on our website. CLICK HERE FOR THE LATEST HEC EVENTS & PROGRAMS! Back handspring clinic coming soon...Visit our "Events & Programs" section for more details! Remember, we require a written 30-day notice to drop ALL classes. It's Season SIX! Don't be left out. Reserve your spot today. Register for tumbling classes today!! !